I've been following this forum closely and decided to purchase from TBS for my new 55 gal tank. I paid for "The Package" a few days ago but haven't heard anything from Richard. He's probably out fetching more rock or maybe taking a break. 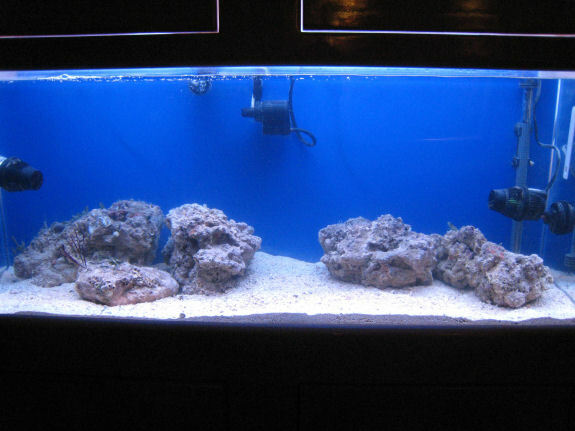 I have my tank all set up and ready to go using the specs that were listed on the TBS website. I have a couple of questions that you guys might be able to answer. How long should I leave my lights on in the tank? I've heard 8-10, but then I saw somewhere else it should be 5hrs. Also I'm wondering from those of you who have already gotten the package is your hermits have attempted to take over your snail's shells. In my last nano, my hermits killed my nassarius snails. I really enjoy reading all your posts. I'll submit photos when I can. I'm posting one now of the tank as it's waiting for the great live rock I know I'll be getting soon. Been crazy this week....did 91 miles on the water yesterday...Gasparilla Festival....and weather has been killing me.....soon as I can dive, yall will here from me! Got an email from Richard that my live rock is being shipped on Friday. I'll be taking some photos to post once things arrive. I'm very anxious to see what's coming after all the incredible photos that people have posted on this thread. I'm sure it's going to be great! Make sure to have a bunch of spare water mixed and ready to go before hand. I have two 32 gallon containers with saltwater that has been mixed and both containers are at 75 degrees per Richard's instructions. There is a store near me called "Super Pure Water" that sells RO/DI water for 25 cents per gallon so I can mix water quickly and cheaply when I need to. I think I'll be OK on the water changes, but you're right about being ready for it just in case there's a large ammonia spike. Well, as promised, here's some photos of things so far. I haven't seen any "bad" critters so far, but I think I have a mantis shrimp because today I've heard a pop sound occassionally when I've been close to the tank. As for hitchhikers, I've got several snails, some worms and a few unidentified creatures that I've seen. Also had a couple of tiny little green crabs that were in the sedement when I took my rocks out of the shipping boxes. There's been a spike of ammonia to about .5 I'm keeping an eye on it if I need to do a water change. There are lots of other "live" things in there, but I need to take more pictures. Tank after I put the rocks from TBS and sand in. Closer look at the rock. 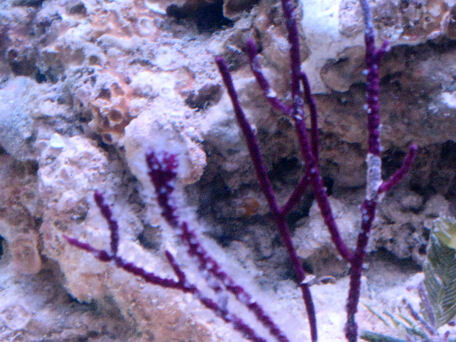 Looks like a nice little purple sea fan/gorgonian. Lucky you! Well, the tank cycled... took 9 days. Everything has been perfect chemistry wise since then. Contacted Richard for Part 2. He's having really bad weather in Tampa, so while I'm waiting, I'll be trying to catch this guy. I knew he was in there, but he wouldn't show his face. Today, not only did he come out, but he actually took a small piece of shrimp from me off of a stick! Rascal! I've been trying the bottle bait setup, but have so far only caught snails. I ordered the X-terminator, but I will probably have the same luck. I'll just have to persist and be patient until I catch him! 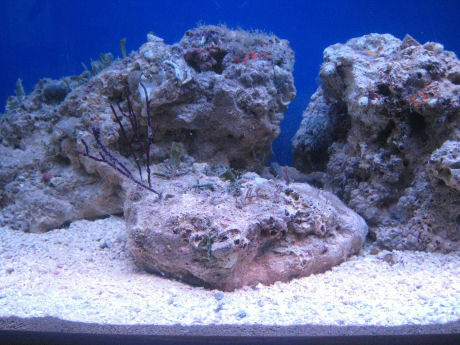 I know where I am gonna get my live rock for my next tank. tbsaltwater fo sure. Great pics. I wish I had rock like that. divemonster yes that Tiger Goby was a hitchhicker. Red City here is a link to the trap I made to catch my mantis. I had a mantis in my tank for close to two years. The villainous predator is responsible for eating numerous sails, crabs, abalone, fish and more in my tank. It was pretty discouraging to buy a bunch of snails and watch him pick them off one at a time. I am ecstatic that I finally caught him. I first tried the trap over a year ago, but the mantis did not seem to be interested. I then tried a commercial trap that had the same success and was actually difficult to use and set. I gave up for a while but I finally decided to go back to the bottle trap once more and found that persistence paid off. After several nights with fresh bait he finally made it into the trap; I just used some raw shrimp after the lights went out. I put the bottle next to his favorite hole and left it there for a couple of hours each night and then voila. Last edited by Red_Six; 03/08/2008 at 06:36 PM. Here is a photo of my TBS flower anemone when I got it in June, 2006 and a current photo of it now. It has changed in color quite a bit. I'm looking at ordering "The package" for my 12g aquapod. looking so far it will be about $160 for the package, and another $100 plus for shipping. from what I've seen, the rock looks worth it, but what do you guys think? Last edited by zoanthidguy; 03/10/2008 at 01:00 PM. well if you want "Live" rock with all the stuff then yes. the *ONLY* time I know of when someone was not happy with TBS rock was when they did not want the hitchhikers that come with it and got upset when they found a bad one. you can find any number of good or bad "extras" in any batch. try to find the crabs when you first get the rock *BEFORE* you add any corals or other stuff. Works for me. If I get a mantis, it will most likely stay in the tank as long as it behaves itself moderately well. I've got no problem feeding hermits to it. Just spear the gorilla crabs with a chopstick from above. Works every time! wow, those shots are really gorgeous. good luck with your new addition. Last edited by BlueCorn; 06/17/2008 at 09:00 AM. Any one else order LR from them. Is he still selling it? Rock looks pretty good, I think i may have to order some, Is anyones rock growing coraline on it yet? are you asking about tbs rock?? if so yes richard is still selling rock, yes I think all of us have good coraline growth, I do for sure. My rock is barely a week old (at least in my tank) and I'm getting a lot of coraline growth. It's mostly covered by diatoms right now, but we're almost done with the cycle. If we could do it 50 years ago with slide rules, why can't we do it now? same here. the ammonia level was no higher than .5ppm by the third day. I had a big spike when the 6inch tall tube sponge died. That's what I've been fighting so far. That and whelks. I must have pulled out 10 of the things so far. I haven't done my test yet today (I have to wait until the boys nap time). I did find a pair of brittle stars this morning. Every day it's something new. I love this rock. I just noticed you are in Lewisville. Heh, I'm closer to Florida than I am you. I love Texas. WOW...6" tube sponge! Sorry to hear it died. I lived in Beaumont a long time ago. I love Texas, too. Maybe one of these days we really will secede from the union and become the Republic of Texas. When you finally catch the mantis what do you do with it? Well, I ordered 50# of live rock Dec 18. 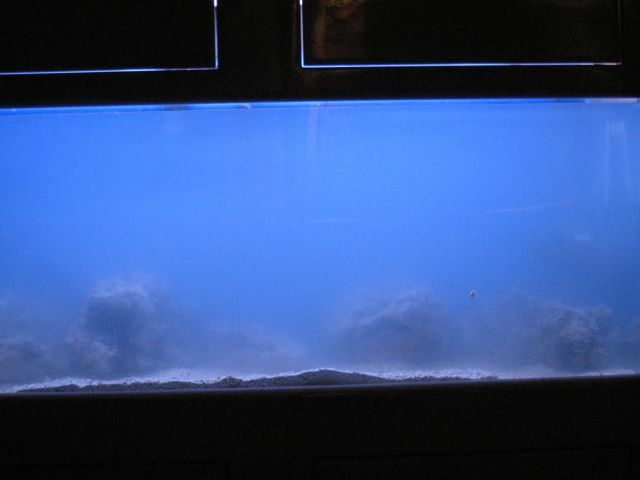 I have a 75g tank with a 40g sump with a refugium and DSB. It has been up and running about 4 months. I had about 85# of live rock from the LFS and MarcoRocks. 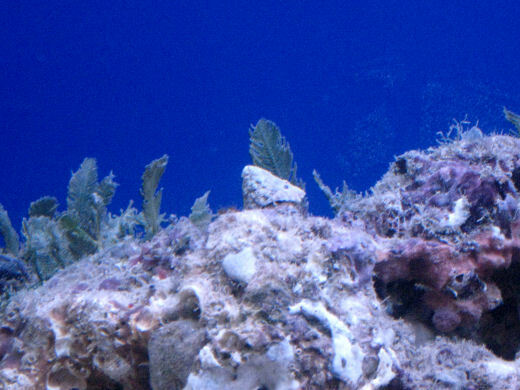 It was getting covered with coralline algae, and some green algae, but not much else. Everything was doing OK, but it did not have the diversity that I wanted. The TBS live rock was shipped Dec 19, and I picked it up that afternoon. It was in three boxes, and the air freight was about $85, less that the quoted $100. Talk about quick turn around. I brought it all home (1 1/4 hour each way to the airport), and opened the boxes. Everything shipped well, with only a slight leak on one box. After removing about 50# of the rock from my tank, I added the TBS rock. Looks very nice, much nicer than the existing rock. I added the rock I removed from my display tank to my 30g quarantine tank. No room for much else there. Immediately after adding the rock, it came alive. Barnacles extended and started feeding. After a while the tube corals opened. In the water in the boxes were many brittle stars, bristle worms, snails, crabs, and two sea cucumbers. Also a pistol shrimp missing one claw. I monitored the ammonia every day the past two weeks. It stayed low, peaking below 0.25 ppm. It is now down to zero, with no phosphates & no nitrates. I did normal water changes on my usual schedule. (10g every other week). After over two weeks, mostly everything is alive. The sponges look like they may have gotten a little smaller, and the not sure about the tunicate. Not sure that they will live. 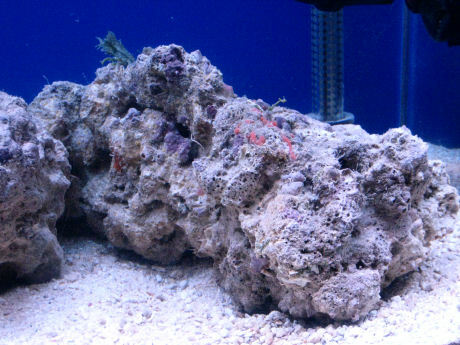 A couple a sponges came off the rock, and I removed them from the tank. The rock included two anemones (Condylactis? ), a small Mithrax Crab, a small white crab, five Gorilla Crabs - all small, many hermit crabs - mostly blue legged, & three jewel box clams. I am discovering new things every day. Overall I am very happy with TBS and their live rock, and recommend them to anyone wanting live rock.